Halter classes are non-riding horse show classes where equines are shown in-hand by their presenters. In a halter class, your horse will be judged based on the quality of his physical conformation as well as his appearance. Halter classes are held by almost every breed association, but the presentation requirements vary depending on the breed of the horse. You must know how to groom your Arabian properly if you want him to place in a halter class. The Arabian Horse Association holds halter classes at most of their horse shows. Judges are rating horses based on whether or not the horse conforms to type, meaning the Arabian breed standard and conformation, which is how well the animals are built. Horses also are evaluated for breeding quality, overall physical condition and grooming, movement, bone and muscle density, behavior and presence in the ring. A well-groomed Arabian horse should be sleek with a shiny coat. 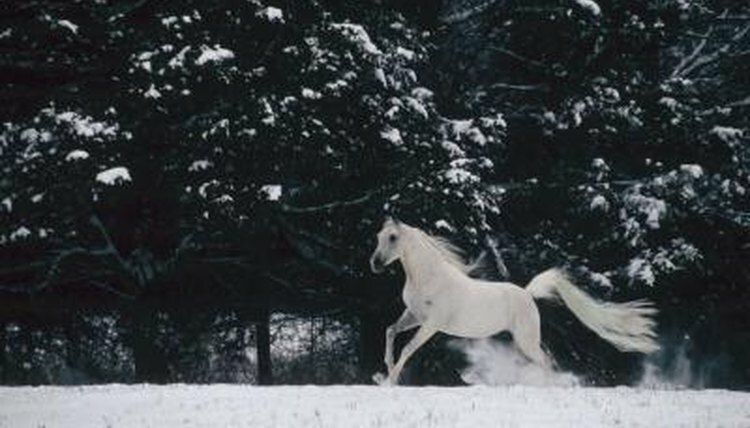 Your horse should not have any type of winter coat. If he does, you will need to clip him so that he is sleek. Spray him down with a grooming solution designed to condition the coat and make your horse shiny. Use hoof polish on his hooves. Stray hair on the muzzle, ears and around the eyes should be clipped. You also can oil the muzzle to give your horse a more polished appearance. Your Arabian's tail should be brushed out carefully, and free of knots and tangles. Spray a leave-in conditioner into the tail to keep it smooth in the show ring. The mane should be left long since, unlike in many breed associations, Arabians are supposed to have a long, natural mane. The mane should be either French braided down the length of the neck, a style that often is called a running braid, or banded into a diamond pattern to create the continental braid. Arabian halter horses are shown wearing a light halter or headstall with a throat latch. Arabian show halters are made of very delicate, thin leather and may be decorated with silver, crystal or beads. The light design of the halter is supposed to accentuate the distinctive shape of the Arabian's head. The Arabian Horse Association also allows the handler to use a whip or crop during the competition, but competitors who over use the crop may be penalized. How Does Brushing Your Horse Affect Its Heart?